The World Science Fiction Convention is an international gather for fans of science fiction and fantasy. The first event was held in 1939, and has been an annual event since 1946. 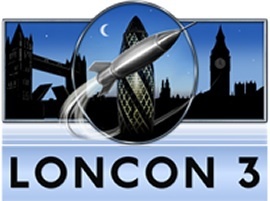 Each year Worldcon is held in a different city, and London is the honoured Chosen One for 2014. Loncon 3 will celebrate all forms of science fiction and fantasy from the literary to the cinematic, as well as sections on comics and manga. Over five days you will get to meet writers, artists, editors, publishers, academics, dealers, and other fans, all of whom will be gathering at London Excel Docklands between the 14th - 18th August. Among the attendees will be a few guests of honour, to recognise their contribution to the science fiction community. These include Iain M. Banks. John Clute, Malcolm Edwards, Chris Foss, Jeane Gommoll, Robin Hobb, and Bryan Talbot. Special events at the show Include The 2014 Hugo Awards, Masquerade, an Art Show, and numerous displays such as Darwin's Pigeons and A Mission To Mars. There are various admission rates, to suit all ages and needs, so whether you want to attend all five days or just one, you can get the best deal available.